Wishing you a happy and smoke-free 2005. Johnson's original magenta armadillo hangs at the regional airport as part of the ArtPort show. The image - on a pristine white backdrop - is like So Arklatex. Down to its Las Vegas hue. What I like about it is the Aristotelian study of armadilloness. We would never see such detail - the perfect tail, for instance - unless a skillful photog like Johnson captured them up close. Tracey Laird was a witty, what-if-we-did-this class president at Caddo Magnet High School in 1988. 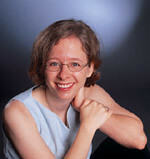 Today she is assistant professor of music at Agnes Scott College in Athens, GA. A musicologist who earned her PhD from the University of Michigan, she has written a book entitled Louisiana Haryride: Radio and Roots along the Red River. The author is married to writer/teacher Brandon Laird, also CMHS '88. The Magneteers have an eight year-old named Zoey. See more about her book at the Oxford University Press US website. Wilco's "A Ghost is Born"
was one of the year's best records. See NPR's All Songs Considered for the Best Music of 2004 - from their staff as well as from listeners. Did you know that All Songs Considered has an unsigned try-out show called Open Mic? Wilco's Jeff Tweedy strums a Fender Jazzmaster. 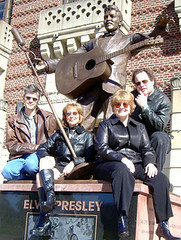 Premier Quartet to perform Daugherty's "Elvis Everywhere"
Premier Quartet performs Daugherty's "Elvis Everywhere"
Happily, the SSO quartet will perform Gershwin, Ravel and Ellington, too. ADMISSION: $15 - student tickets are always $5. TICKETS: Call the Symphony box office at 227-TUNE (8863) between 9 a.m. and 5 p.m. Monday through Friday. Or buy tickets as you enter Hurley. Explore the new world of cartoon funk presented as Art. Check out leland strebeck's work at Prima Tazza. Prima Tazza is at 8835 Line Avenue (at the Ashley Ridge / 3132 intersection), and serves coffees and desserts. Call 550-0174 for more details. And for more of leland's work, please see Northwest Louisiana Art Gallery. 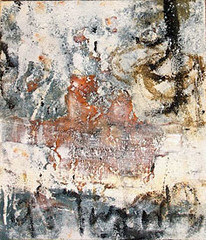 Textures on Gingles' multi-media paintings appeal to the viewers' need for sensual, tactile stimulation. Bill Gingles' paintings include textured surfaces that remind him of surfaces of the old walls, buildings and ruins he's seen in Italy. 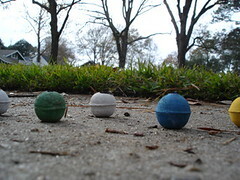 "But my aim is not to simply create interesting surface textures," Gingles said. "I'm after the feelings one has when faced with the ancient structures, the weathered and scarred but still standing works of humanity. My paintings are about those parts of our best efforts that do not erode with time." Gingles' paintings will be part of the Stephen F. Austin State University College of Fine Arts exhibit "Painting in the Gestural Tradition." The opening on Saturday, Jan. 22, will include a 6 p.m., reception and a 7 p.m. gallery talk by Don Reichert, retired professor of art from Manitoba, Canada, and one of the exhibiting artists. 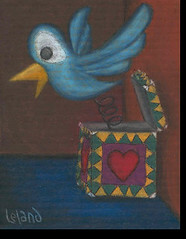 The show will remain on view through Thursday, March 24, at The Art Center, 329 E. Main Street in downtown Nacogdoches. More info: 936-468-2801. Pop culture alert / you might consider avoiding . . .
3) confused when it came to Jim Carrey. Is it possible to be both cruel and at the same time off-the-wall comical? The coolest part of the movie was the animated sequence that accompanied the credits. The credit music was sweetly percussive and global. The predictable Big CGI Blast came with the destruction of the house on a cliff over Lake Lachrymose. Twas impressive. But the cataclysm was academic since the characters weren't emotionally engaging. One more disappointment: the vaunted meryl Streep flailed about like a rookie. The show has style, but I think it tried too hard. I'm tired of funky British esoterica such as brass and glass antiques; this movie acted as though it was all new and irresistably precious. Too bad the characters had so little charisma, Stefen. An alternative? "The Incredibles" is a tour de force of moviemaking, if not as soulful as "Toy Story" or "Bug's Life." A caravan composed of mourners in silver and black sedans will convege on Columbia Cafe, corner of King's Hwy and Creswell, in a tribute to the late writer Susan Sontag. Her books will be distributed free to the indigent by volunteers from the Centenary Book Bazaar. "We've got a warehouse full of pristine copies of her work," said Delia Weyerhauser. The Land Rover Owners Association (LROA), Movie Critics' Association and Krewe of Apollo will provide a wine & cheese benefit for the hoi-poloi. Said mayor Keith Hightower, "I've enjoyed reading her essays and novels for years." Matthew Linn, Columbia Cafe owner, rolled his eyes. While all above is fiction - I claim blogsters' license re keeping things entertaining - the quote below is ... well, I'll let you decide. 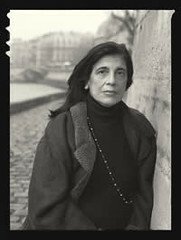 The NY Times' Margalit Fox wrote "Through four decades, public response to Ms. Sontag remained irreconcilably divided. She was described, variously, as explosive, anticlimactic, original, derivative, naïve, sophisticated, approachable, aloof, condescending, populist, puritanical, sybaritic, sincere, posturing, ascetic, voluptuary, right-wing, left-wing, profound, superficial, ardent, bloodless, dogmatic, ambivalent, lucid, inscrutable, visceral, reasoned, chilly, effusive, relevant, passé, ambivalent, tenacious, ecstatic, melancholic, humorous, humorless, deadpan, rhapsodic, cantankerous and clever." America's favorite photographer is the late Ansel Adams. It's a moment of good taste in a crass culture. 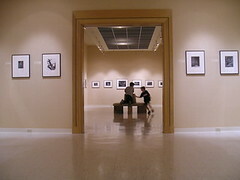 The exhibit, Ansel Adams: Celebration of genius, has been extended to January 2, 2005. The RW Norton Art Foundation Gallery has been undergoing quiet but steady growth under the helm of Lewis Norton. The 2004 exhibit of photos by Eudora Welty brought us unusual material - black life in the 1930's - as well as excellence in image making. The Adams exhibit is extensive, offering enormous stimulation to artists. The Norton has new website, too. Please see their hours, map and exhibit schedule here. 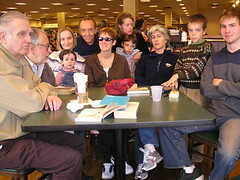 A gang of Euros and Americans who gather once a month to converse en Francais. First Saturdays, 9 - 11, B&N. Sometimes the group's larger, sometimes smaller. 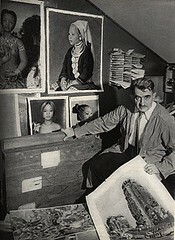 A nonpareil collection of paintings of Indochina in the 1930's can be found in the Meadows Museum of Art, Shreveport. Call 869-5169 for their limited hours. Meadows Museum of Art is a Centenary College institution. Therefore they can close over the holidays. And they do. My friends Diane DuFilho, director, and Kathy Brodnax, manager of collections, are crazy for art and are dedicated to Meadows, which is a jewel. And one of the mitigating aspects of working for a school - they are not getting rich, are they? - is the blessed relief of long holidays. They have parents to care for, they have friends and siblings and a life to lead. But to close Meadows over the holidays does not make sense. Meadows is more than an adjunct to Centenary College. It is a vivid resource for the educated class of this region. When friends and relatives come to town, a visit to Meadows provides a shining moment in what can seem a dreary town. To retain the professional class in a town like this requires a team effort. Surely successful Centenary president Ken Schwab and director Diane DuFilho can find a way to keep Meadows open during college holidays. Ah, the pita and tzatziki sauce of the Eastern Mediterranean. The salty lamb strips, the dark dolmades. Locally we're fortunate to have 2 good Greek restaurants, Athenian Delights & the Sea Grille and Yeero-Yeero (six exclamation points on their endearing sign)! Recently we've enjoyed the elaborate new dining room added to Yeero Yeero. It's like an outtake from My Big fat Greek Wedding inasmuch as it's about Greek pride in food, in hospitality and history. The crystal glasses, marble-topped tables (3) and eating bar, comfortable chairs, tiled ceiling and marvelous brick-a-brack will bring a smiile to one's face. 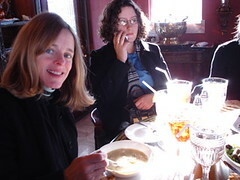 In several visits we have found the service excellent, the food consistently well-prepared and the tariff remarkably low. Yeero is located atop a small acropolis near the corner of Youree and Southfield/Pierremont. If you don't have time for the dining room, they are adept at drive-through service. Call them at 219-0027.